A lot of times just the sheer volume of patents [is] sufficient to deter someone from filing suit against you. When you have the potential to get a court order that will exclude a competitor’s product from the marketplace, that is a very powerful thing. 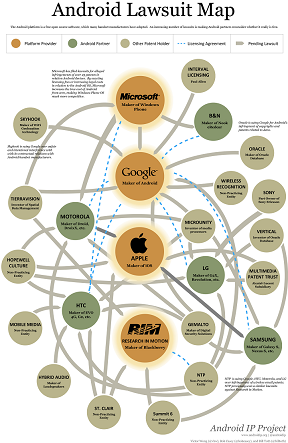 Apple and Microsoft both had lots of patents that could potentially do that with respect to the Android products. And unless and until Google is in a position where they have patents to raise those same threats, there’s no reason for Apple and Microsoft to back off. They’re either going to get the products excluded or they’re going to get damages and/or royalties going forward. Even more threatening, perhaps, is the specter of rulings preventing Android phones and tablets from either being sold or using certain types of functionality. Apple and Samsung and then Apple and HIC have been at war on Patents with Apple insisting import ban on Samsung on Samsung smartphones and Tablet in certain states. Google’s rush into the smartphone market as an outsider “seeking to get to the front ranks” very quickly afforded it little time to build a defensive portfolio or negotiate cross-licensing deals to head off lawsuits. The key for Android will likely be in Motorola’s patent portfolio, when and if Google officially takes ownership of the company. None of this will be positive for Android. If enough of these lawsuits get through in which Android is found to infringe some of these patents, the question is what could Android do. If they could not design around the patents that could be a problem. Analysts bet that Google is hoping that they can design around all these patents, but certainly the infringement cases are a concern. Apple and Microsoft share a similar approach in patenting technology quickly and frequently, a more common strategy for commercial software than for open source software such as Android.But the use of open source software and a smart, defensive patent strategy are not mutually exclusive. Red Hat, in the enterprise server market, has shown that an open source company can publicly oppose the software patent system while building up a portfolio of its own, offering customers indemnification against lawsuits, settling with patent trolls when a fight wouldn’t be worthwhile, and battling aggressively in other lawsuits when core issues are at stake. 1. Indian Mobile markets on a growth curve. Year-on-year, shipment growth of 13.8%. 2. Q3, 2011 Indian mobile phone market grew by 12% in units shipped, over the previous quarter (Q2,2011), to clock 47.07 million units. 8. In the Smartphone segment, #Nokia led with ODM shipment share with 35.3%, but Samsung came closer at 26%. In the earlier post i have examined 2 reasons why Microsoft’s bet on its legacy enterprise solutions is not a surefire formula to success in next generation computing devices. In this post, we examine the other 2 reasons: Applications and Pricing as two other deterents to the success of Microsft in Tablet space. Windows 8 is the Microsoft’s most important bet ever. However, Windows 8 is only a tablet on the surface — there’s no guarantee that app makers will jump on board to create great touch-enabled apps as they have for the iPad. Android and Apple have moved in on application development, and even enterprise use, areas where Microsoft with its cadre of developers should have been reigning supreme. The upcoming tablets running Windows 8 are being squeezed between low-cost tablets from Amazon and the $500 iPad with its well-established ecosystem. On the low end, Amazon and Barnes & Noble can sell tablets as a loss-leader that get users to buy more digital content. Microsoft can’t compete there because it simply sells the operating system and its hardware partners won’t be willing to match Amazon’s price because they have no services on which to make money. Microsoft’s fee for Windows 8 tablet version will be $30+. If that is true, right off the bat, the bill of materials costs of Windows 8 tablets will most likely force prices much higher than today’s low-end iPad. If Apple starts lowering its prices in 2013, as I suspect it will, Windows 8 tablets would be at premium pricing. Microsoft’s PC partners simply might not be able to make the kind of tablet hardware that captures users’ attentions and wallets as the iPad has done. Summarizing the scenario… slow development and delivery schedule isn’t Microsoft’s only problem- iPad’s move into office productivity, consumer interest in Android tablets, pricing of the tablets (at least versus Android) and the level of OEM support for Windows tablets may be affecting consumer interest. Windows 8 tablets are expected to come to market starting in the fall of 2012.However, I would believe that Microsoft is taking too long to bring its Windows8 tablet, a true iPad competitor to market. While it is widely believed that technology, interface and devices would be a three horse race, Forrester believes that Microsoft may have missed the peak of consumer desire for a product they haven’t yet released. Microsoft hasnot quite been a fast follower. It is at best the 5th mover after iPad, Android, HP WebOS and Blackberry Playbook. While Windows’ product strategists can learn from these products, other players have come a long way in executing and refining their products — Apple, Samsung, and others have already launched second-generation products and will likely be into their third generation by the time Windows 8 launches. At the high end, by the time Windows 8 tablets come out in late 2012, the iPad will have been on the market for more than 2 years, and will have an enormous head start in terms of apps and hardware peripherals. Also, in air are rumours that Apple iPad is readying a 7” tablet at significantly lower proces which would be instrumental in taking the battle to low end Amazon tablets of the world. I had blogged sometime back about how Microsoft could move in through a differentiation perspective from iPads and Android tablets by focusing more on office productivity and gaming. However, Microsoft might be overestimating that business users would prefer the ability to run legacy apps (especially Microsoft Office) and that would in turn would provide traction. Condequently, Microsoft tried to get their sales force to emphasize the enterprise shortcomings (like lack of security) of the iPad when selling against it. Windows 7 wasn’t a touch-centric operating system and Windows tablets to date have been pricey, heavy and lacking good battery life. Microsoft had tablets for many, many years. And Microsoft Office had always run on them. Office has been available on Microsoft tablets for almost a decade, and it didn’t help those tablets sell .That was not a selling case for tablets (The experience factor). Plus, it’s not even clear that the next version of Office will be fully revamped for touch. Thus, Microsoft and its partners won’t have time to redesign Office for a superlative touch based experience and other applications to work with the new Windows 8 interface. So customers will see tablets with a great touch interface on top and garbage underneath. During a recent speech to delivered at the City University in London, Wikileaks founder Julian Assange said that most smartphones can be hacked remotely with ease. “Who here has an iPhone? Who here has a BlackBerry? Who here uses Gmail? Well, you’re all screwed,” Assange said during his talk, which followed the release of 287 documents related to mass surveillance. Assange explained to the crowd that more than 150 private organizations in 25 countries can easily track phones and intercept messages, browsing history, email accounts, phone calls and more remotely. Carrier IQ refers to a suite of what can seemingly be described as spyware pre-installed on a wide range of devices by both carriers and vendors. Carrier IQ was conceptualized by Telecom carriers to understand what problems customers were having with networks or devices for action to improve service quality. It is used to collect information to understand the customer experience with devices on networks and to devise solutions to use and connection problems. The IQ tool was not allowed to look at the contents of messages, photos, videos, etc (as a moral responsibility). Carrier IQ is marketed as an analytics tool for mobile telcos, this software claims to exist to ensure good network performance. Shortly after, Wikipedia in its report “the reality of the international surveillance industry” elaborated CIQ technology to spy mobile users across US, Canada, UK, Australia and several of the regimes in North Africa and the Middle East. The Carrier IQ technology has been used in Bahrain to track human rights activists. The malware reportedly can “record every use, movement and even sights and sounds of the room [a phone] is in.” The Wikileaks documents are particularly compelling given the recent revelation that millions of smartphones have spyware called Carrier IQ installed, an application that is capable of allowing wireless carriers to spy on their customers. It is likely still too early to panic, however. Despite the extensive coverage this story has garnered across tech blogs and in the media, it remains unclear exactly what Carrier IQ and its clients are doing with this data. It isn’t even clear what data carriers have access to. Carrier IQ software on Android devices can log anything from usage data and location to key strokes and usage habits, but it has not been determined that this data is sent to carriers regularly or at all. Carrier IQ’s software can theoretically be used as a window through which carriers can spy on users in real-time if they so choose, but whether or not the software is used in this manner is also unclear. But, as Assange rightly points out, the interception of this data will lead society to a “totalitarian surveillance state”, if the spying racket is really what it is about. Presenting a snapshot of CIQ related statements issued by different handset makers and carriers. Web 3.0 is here in earnest except that many understand it yet much less seeing it. The equation is akin to the discovery of Web 2.0 which happened in 2006-2008 although it had started earlier in 2002-04 era. Many people did not realize what Web 2.0 was until they were at the height of it. However in all earnestness, capabilities of the Social Web had already been set out years before the peak. In a very similar manner, Web 3.0 powered by semantic and meta-data is establishing its roots thick and fast and the current businesses are oblivious to its disruptive capabilities. As Internet outgrows search, Semantic is the new key for information search, personalization and delivery all rolled up into a contextual format. A few are investing into understanding and preparation for the onslaught of Web3.0 (Schema.Org by Yahoo, Google and Facebook for instance) and the technologies there-of (HTML5). Also known as Semantic web, the technology promises to transform the web into an ultimately connected experience in which a machine has as much awareness of the content as a human.This is equally if not more significant to the social revolution of web 2.0. Use Cases, Technology evolution and a better user experience- These are the three cornerstones for technology impact and reach. 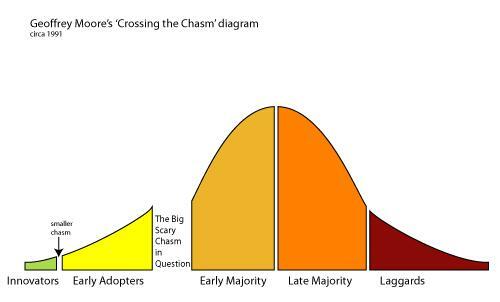 Web 3.0 already qualifies overwhelmingly on this count and its only a case of crossing the chasm sooner or later on Geoffrey Moore’s Timing to market entry paradigm. Putting it all together, the potential is there for a much larger wave of technological and cultural innovation now, than at the beginning of Web 2.0. Not only is this significant enough to be compared to Web 2.0; its bigger!